I've been welding in this car for a year and never had anything like this happen. Contaminated gas? Running straight argon, right? Who's the supplier? Brownish-yellow haze looks like bad gas. Same thing happened to me. My welder puddled cleanly then changed bottles and all went to crap. I picked up a new bottle today (Airgas) so I'll see if it's better tomorrow. It looks like you are missing a good amount of gas. Possibilities: Did you take off the wire feed hose? somtimes when you put the feed hose back on it doesn’t go all the way in and it leaks gas, listen for leaks near the machine and gas coming out of the gun/ torch when you hit the button. What type of gas do you have? co2 air mix for mig, argon for tig. Is the gas on (stupid sounding question but you never know)? Is the flow rate high enough? depending on machine and wind. On mig it’s about 20-35 gph (or was it liters per hour..... just read what it says on ur machine). Just give everything a good once over and im sure you’ll find the problem, good luck! What does the bottle say? Looks like 100% argon to me.. It will be a sluggish weld. Don't most people use the 80/20 ArCO2 mix? 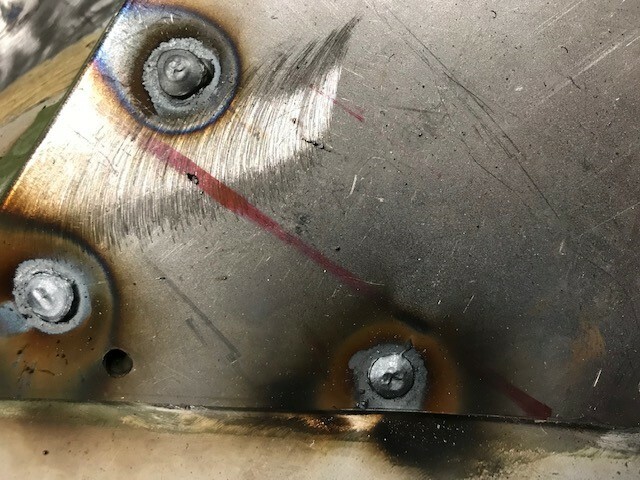 I wasn't sure if he's using MIG or TIG. I've always used straight Argon with TIG on steel. Pure argon is typically for welding aluminum. Thanks everyone. I’m running a mig with 75/25. Checked everything, no leaks and replaced the nozzle and tip. I’ll call th gas company. Could be a combo of the gas/windy conditions and base metal changes.. Curious, did you get new bottle of gas and did the issue resolve itself? Playing with welding Titanium. Uses absurd amounts of gas and needs to be purged on the backside. Rest assured, I won't be doing any aircraft welding. Bottom; closer yet but I think I need bigger #16 cup and a bit less heat. Should be pure shiny silver. That golden straw color is borderline. First issue is that steel is coated. Need to grind it clean like that small swipe halfway through the upper weld except everywhere you are going to sample. Pull the nozzle off and clean the slag out as it may be shorting your contact tip causing the wire to stick to the tip. Check the gas diffuser while the nozzle is off while you are in their and make sure its not plugged with slag balls and gas is flowing. Change the tip. Purge both sides of the regulator. 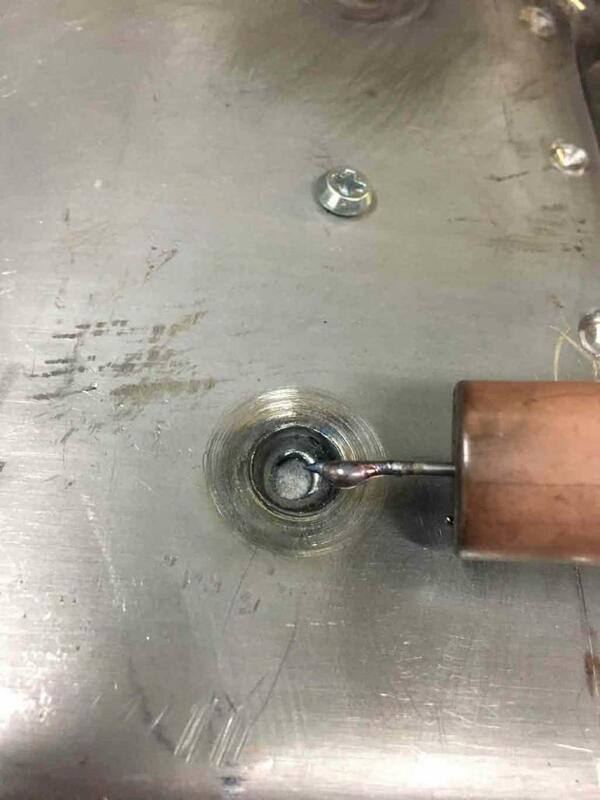 Open the tank valve and then while you are squeezing the gun trigger open up the flow regulator to about 45, then wind it back down to normal flow rate . What regulator are you using? C02? C02 with adaptor or an Argon regulator? That rusty almond frost around your welds looks like restricted shielding gas or really low to almost no flow. Gas blends vary by far with industrial suppliers so perfect 75/25 mixes aren't realistic, 75 – 95 percent Argon and 5 – 25 percent CO2 is considered the normal these days when filled from a manifold. 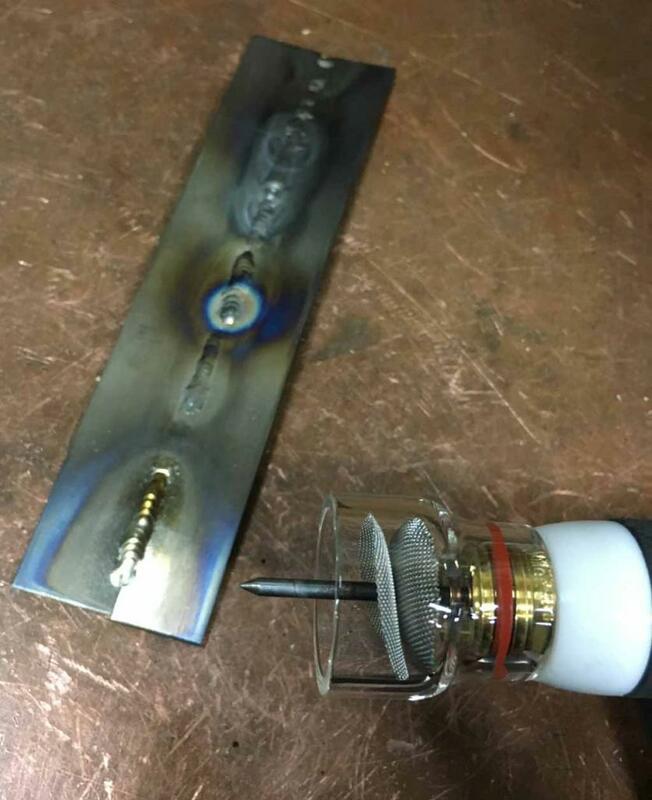 Its not much of an issue welding, both work fine even if the blend % is off. Most people would not notice it. Does the tank they gave you have a painted shoulder that's different than the primary color of the tank? If so what color is the shoulder? If you think the fill is contaminated take the tank back and tell them you have a slugged tank, they should exchange it -it happens. My issue was bad gas. A new tank and all is well. Never had that happen before. It happens to all of us. My dog is the worst. Still curious if OP's problem went away. Jeff, any advice on TIG'ing Galvanneal? I've tried grinding it back (both sides) but some of the zinc is actually annealed into the steel and can't be removed by grinding and still leads to electrode contamination and puddle pops. Not an issue for MIG. At this point it's painfully slow with TIG but I'm surviving. However, the thought of going back to a MIG rig has crossed my mind several times now. Best success I've had is by feeding as much filler as quickly as I can. I suspect it helps dilute the zinc in the puddle by getting fresh filler (ER70-S2) in there. Apologize for thread high jack. I'll post fresh thread if I've offended anyone but this appears to have the attention of the welders among us. Talk to @Peteyd at Restoration Design besides the panels they do some high end resto's and have a full time metal guy tig welding their panels that are Galvanneal. RD might even have a vid on YT showing how they prep their panels.